Thomas Lawrence dominated the art of portrait painting in England for forty years, undertaking commissions for the future George IV from 1814. After 1818 Lawrence was largely occupied in the major royal commission for a series of portraits of the European leaders who had combined to defeat Napoleon. The series was initially proposed for Carlton House, but George IV's plans for Windsor Castle latterly came to include a new room specially created (from an open courtyard) for the display of Lawrence's portraits, the Waterloo Chamber. This portrait is arguably the most magnificent of that series. Luigi Barnaba Chiaramonti (1742-1823), elected Pope in 1800, was imprisoned by Napoleon in 1809 for opposing his plans for the annexation of the Papal States. 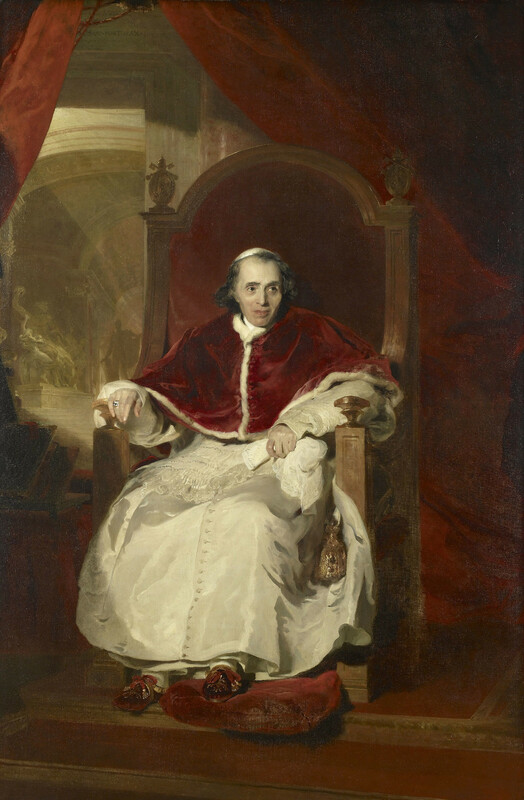 After his triumphant return to Rome in 1814, Pius VII became a focus for the political and spiritual regeneration of Europe. Lawrence arrived in Rome in May 1819 and was accommodated in the Quirinal Palace. He was given nine sittings by the Pope. Lawrence must have recalled his great predecessors in the tradition of papal portraiture: Raphael's Julius II (London, National Gallery), Titian's Paul III (Naples, Capodimonte) and Velázquez's Innocent X (Rome, Galleria Doria-Pamphili), as well as contemporary portraits. Here, in contrast to those examples, the Pope is shown full length. His pale face, set off by jet-black hair, is made more vulnerable by the play of vivid red and white and the magnificent portable papal throne (the sedia gestatoria). With dazzling surface effects Lawrence portrays the Pope, a symbol in his time for the victory of peace over war, as a spiritual ruler with temporal power and all the trappings of authority. In the left background notable pieces of classical sculpture in the papal collections are shown in the Braccio Nuovo, created for their display under the supervision of the sculptor Canova, who had secured the return of the collection from Paris. The paper held by the Pope is inscribed 'Per Anto. Canova' (for Antonio Canova). The portrait has long been regarded as Lawrence's crowning achievement.